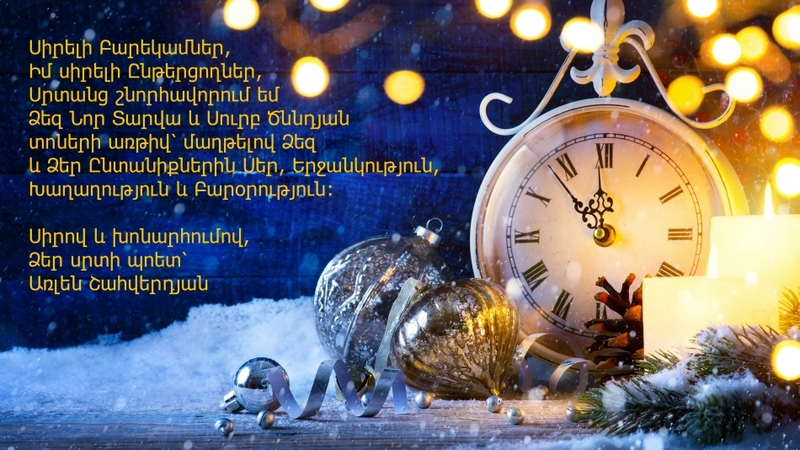 By Arlen Shahverdyan in Նոր տարի / New Year, Տարբեր / Various, Իմ բանաստեղծությունները / My poems, Իմ մտքերը / My Thoughts on December 30, 2018 . All the best for 2019, Arlen. Thank you my friend!!! Merry Christmas and Happy New Year!!!! Very happy 2019 for you and your blog! All the best to you, too!!! I wish you many many new interesting posts. I am proud to be your constant reader and follower of your blog. Thanks for being with me in 2018! I hope you will follow me in 2019 too! 🙂 Merry Christmas and Happy New Year!!!! Let it be a year of happiness and love, peace and harmony! I hope all your wishes will come true! I hope, too! Your blog is very unique and I am sure that in 2019 all we will read there many new and interesting posts! Your blog deserves to be read everywhere. However,, recently my statistics show some visitors from Turkey. Maybe they have found a way to circumvent the censorship. Maybe! 🙂 Your blog deserves to be everywhere too, my friend! Dear Linda, Merry Christmas and Happy New Year!!!! Thank you so much, wish you all the best in 2019! !